Tokimeki Memorial Drama Series Vol. 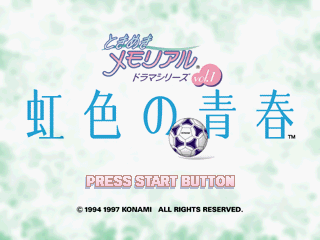 1: Nijiiro no Seishun (ときめきメモリアル ドラマシリーズ Vol.1 虹色の青春) is an adventure game developed and published by Konami for the Sega Saturn as part of their Tokimeki Memorial series. It was followed by Tokimeki Memorial Drama Series Vol. 2: Irodori no Lovesong. Main article: Tokimeki Memorial Drama Series Vol. 1: Nijiiro no Seishun/Magazine articles. NIJI_ABS.TXT TXT (Abstract) 664 About this game.